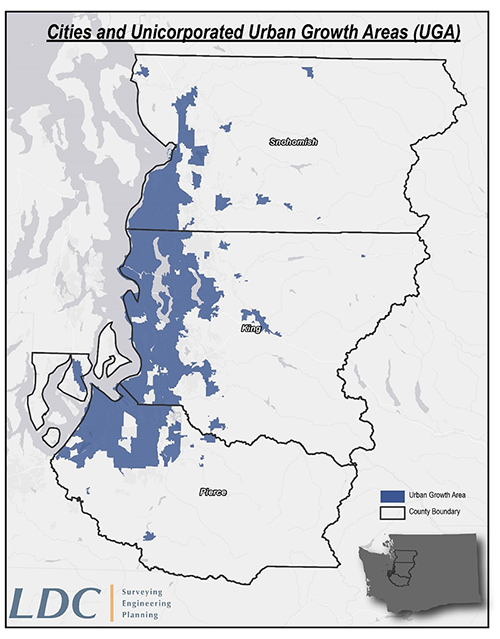 LDC, Inc. was tasked with analyzing King, Snohomish, and Pierce Counties to identify and map large underdeveloped or redevelopable Greenfield areas and groups of parcels. With the rapid growth occurring around the Puget Sound Region over the past two decades, most Greenfield areas have been utilized and growth is now focused on redevelopment. Large blocks of underdeveloped urban, non-publicly owned land in the King, Pierce, and Snohomish County region are very difficult to find. This project required the collection and analysis of county GIS data in a manner comparable to a buildable lands report. Through the GIS analysis, LDC, Inc. was able to identify several sites within the tri-county area, provide a summary for each site, and produce a set of accompanying maps. LDC, Inc.’s understanding of Buildable Land and Land Capacity analyses allowed us to provide a detailed parcel level analysis. In addition, using effective cartography, LDC, Inc. provided map products to help the client communicate the information easily.